Having been very much impressed by my stops at Uncle Joe’s Coffee House in Coorparoo, it seemed logical to check out a fellow client of 3rd Crack Coffee Brokerage when we ventured to the Gold Coast on our day off this week. So we drove down to Nobby Beach, and walked past a bunch of more visually obvious cafes to this little gem. Stephanie, the owner, was very happy to let us park our pram next to the big wooden table inside her eclectic and colourful little shop, which is currently serving up a delicious blend featuring a Guatemalan Finca San Rafael Urias. The coffee lived up to the hype, but was especially good as the “barista’s choice” – so few cafes make obvious recommendations about how you should sample their coffee, but there, on the board, was the recommendation to try the blend as an off the heat short long. So I did. And it was fruity and sweet. Stephanie was very excited about the coffee, she was also very keen to know that we’d enjoyed it, without being intrusive. It was such a warm and friendly little shop filled with colourful bits of arts and craft, and decked out with clever furniture like wooden milk crate seats, and skateboard deck tables. It appears from their website, and beanhunter reviews, that they’ve only recently switched to 3rd Crack. That decision appears to have paid off. Also, when almost every (very positive) review on Beanhunter mentions the friendly service, you know you’re on a winner. We had a lovely hour or so reading the paper, sampling the wares, and enjoying the coffee. You can find both 3rd Crack and Canvas on Facebook. Pompidou is a quaint French themed cafe in the leafy suburb of Balmoral. It’s a Di Bella account, and they do an admirable job of producing drinkable coffee from their 2-group Wega. My double shot flat white was strong and rich, Di Bella style. I’m starting to think that Di Bella probably works best as a single shot. It can be quite overpoweringly full bodied if prepared well as a double. My dinepanions said their coffees – a cappuccino, and a piccolo, respectively, were tasty. The coffees were good. The breakfasts were fantastic. What follows are pictures of my pork belly with poached egg, spicy relish, haloumi, bread, and baby spinach, with a hash brown on the side, the “pan meal” which is pretty much the ultimate big breakfast, a ratatouille with bacon and eggs, and an Eggs Benedict, with the hollandaise on the side. Each meal was delicious, and well worth the price of admission. We’ll be back on the strength of the food alone, and the coffee wasn’t too shabby. Toowoomba may be able to claim, per capita, to be the best coffee destination in Australia. I’ll know after my next visit, when I’ll check out a new specialty roaster I noticed yesterday. But what started as a movement with the Angel Cafe, which boasts Australia’s first Synesso, and began to come of age with Findos, the shopfront of Sleepless City Roasters, is now a bit of a coffee haven. Firefly rightly takes its place in this increasingly diverse scene. Firefly serves up a couple of blends from Supreme Roasters, and a couple of single origins are on offer through the cold drip. My double shot flat white was packed with body, and on the first sip smacked my mouth around. It mellowed a little bit towards the middle of the cup, and my wife, who’d already had her morning coffee, took a sip and declared it “good.” I’d say it was like a strong and pretty rich dark chocolate. Breakfast was very tasty. Especially the haloumi on my Firefly Feast. I went back for another coffee. A single shot flat white this time. And it was superb. So silky and sweet, I thought maple syrup, but I had that on the mind because of what I’d ordered to follow. It was on the Miss Katy blend, the first was on what I think was called the Southern Blend. I probably wasn’t paying as much attention as I should have been. The Cold Drip with maple syrup on the side was just sensational and refreshing. Better with the maple syrup than without. I drizzled it over the ice before I poured the coffee into the glass. Winner. This was a worthy stop, but I was glad to check in at Findos for a flat white before heading down the range. During a recent holiday at Byron Bay, we ducked up the hill to the delightful town of Bangalow. I remember Bangalow fondly because of years of Northern Rivers television advertising Abracadabra Baskets (I’ve included the ad at the bottom of this post – the video quality is awful so I’ve tried to clip it to just the video controls). Anyway, we stopped in at Zentvelds, a pioneer of sorts in the Australian coffee scene, they specialise in Aussie grown coffee, as well as sourcing beans from around the globe. It’s nice to walk into a cafe in semi-rural Australia to find a shiny Synesso and a barista who clearly knows his craft. I’m formulating a theory that you can judge a cafe by the books and magazines available in store – anybody featuring Crema, Bean Scene or Cafe Republic – a book about the Australian coffee industry (featuring a chapter about Zentvelds) is probably worth checking out. Zentvelds took over a pizzeria when setting up shop, so there are still some bits and pieces (and menu items) left over from the old days. The Zentvelds Cafe in Bangalow backs onto the town’s sub-tropical rainforest, and has a nice outdoorsy deck, complete with chandelier – because that’s how Bangalow rolls. The temperature and texture were spot on – and if you’re on a bit of a jaunt to the Byron/Bangalow region you can rest assured there’s good coffee to be had in a few places. And Zentvelds is one of them. I’ve been to Findos a few times. Not for a few weeks. But I was looking through my photos and my little iPhone record of tasting notes and realised that a review was in the offing. And long overdue. Toowoomba has an amazing coffee scene, for its size, and Findos is the pick of the bunch. It wouldn’t be out of place in any capital city in Australia. It’s quality. And they’re serious about their coffee. I should disclose, I guess, at this point that I know the guy the cafe is named after pretty well. I’ve known him for 9 years or something, and I met Tim, Findos owner, through him. And I like them both. This, I guess, is a case of declaring my bias. I’m not going to slam them because, hey, I like the guys. But thankfully my blogging ethics aren’t being put to the test because the product truly stands up to scrutiny. It’s amazing. Findos uses its own house blend. And has a regular rotation of featured blends and single origins. Roasted not in house (but I believe, in a house). Tim is always up for a chat – I know it’s not special treatment because there have been times that I’ve been there (I stop in whenever we’re driving through Toowoomba to visit my in-laws) and only managed a courteous tip of the hat in his direction because he has been so engrossed in a conversation about coffee. He loves it. And it shows. 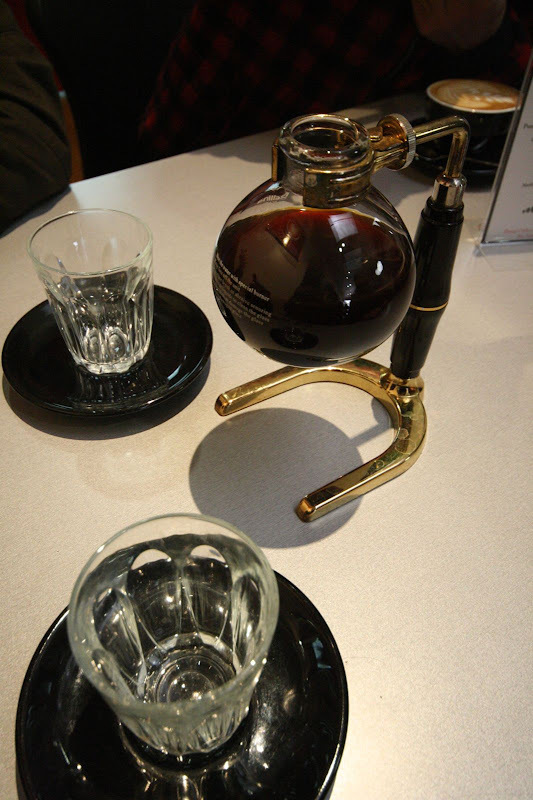 Findos was also the first place I ever tried syphon coffee. About a year ago. If anything the quality has gone up since then. Which is nice, plenty of regional cafes don’t maintain the rage. The menu is simple, but tasty. We had a cracker Pumpkin soup on one stop there this winter. When I was in there in June the house blend featured Brazilian, Indian, and Indonesian beans, and it was sensational. My notes say it was sweet and delicious like a Caramello Koala. They were running a “Berry Bomb” blend too, with some Yemen Sanani and Some Ethiopian Harrar Mao Blue Horse. That didn’t work very well in milk – but it was their recommended espresso and brewed blend (so I was basically using it for a purpose other than that which it was intended for). That blend changed after the Toowoomba floods. And, while I don’t have notes on the new blend – it was good enough that I had two of them in the one visit. So if you’re in Toowoomba and hanging out for something more than a caffeine hit, you could do worse than Findos. You can also “Like” them on Facebook. There. I feel like I’ve restored the balance somewhat or something. This one is brand new. Hot off the press. It opened today. And we were there because a friend is waitressing there and it was her first shift. But I’m all about objectivity here – so it’s lucky I don’t have any bad stuff to say. The outdoor area is still under construction – though it should be open by Friday. But inside is fresh, spacious, and like a modern household dining room. Very clean. Airy. Bright. You know you’re in for something special when the latte art on your cappuccino matches the latte art tattooed on the barista’s wrist. That’s a sign of some serious commitment. These guys have a pretty sweet Synesso Cyncra. Which is some serious coffee kit. At this stage there’s one grinder on the counter, but Kane, the head coffee dude/tattooed barista, says he’s after more. And wants to build a brew bar into the offering. Which can only be a good thing. I had a great chat to Kane, who is very friendly. And seriously artistic. Even in a takeaway cup that then got coated in chocolate powder and a lid. It certainly had those – but with a great butterscotch/caramel taste too. Which I love. Kane is clearly a perfectionist – he told us as we were drinking that he wasn’t happy with the foam depth on our cappuccinos (I had a perfect double shot flat white), but they were fine. And greatly appreciated by my dinepanions. The food was good too. Fresh. The breakfast burger was excellent, and speedily prepared. Though it helped that we were the only table in the house – and that we’d told them we were on a deadline. We’ve been meaning to get back to Campos for some time. The food there is just amazing. One of the best cafe breakfasts I’ve had – it is like Campos have created the optimum crossover point between breakfast quality and coffee quality – in some places the food is significantly better than the coffee, in others the coffee is significantly better than the food. At Campos, food and coffee are on par. It’s an attractive package. The coffee jumps out at you on first taste, it rounds out on the tongue and has a lingering chocolatey aftertaste. On previous visits the coffee has been hit and miss. This one was a hit. My first trip to Campos I got there as it was closing, and all I got was a takeaway, and for some reason it was just too hot. It was so hot it was almost undrinkable, and the taste in a takeaway cup is always a little less pleasant than in a nice porcelain cup. I love the atmosphere at Campos. It’s a place that just smacks of coffee. There are carved rosettas on the wall. And two La Marzocco machines on the counter. The cake cabinet is full of pretty amazing looking sweet goodies. But I haven’t tried them yet. I love the fans (which you can’t quite make out in this picture). I love Campos, and highly recommend it as a breakfast stop. But I do think there’s a trade off that comes with being a bigger operation. They lose some of the intimacy on offer in some of the other cafes I’ve reviewed here. Some people I’ve spoken to have suggested that Campos are a little too coffee snobby – and they do have a legendary reputation for taking snobbery to new levels in Sydney. That’s not a critique I think is valid. I want my coffee makers to be as snobby as possible, so long as they’re also able to stay human. Legend has it that in the espresso bar setting Campos baristas don’t even speak to each other. They communicate with dice and spoons. And these dice, and spoons, are there. Sitting on the counter. On Friday night, after downing a duck stir-fry and a beer (or two) at the Newmarket Hotel, we headed out to Racecourse Road with our dining companions for some after-dinner gelati and coffee. Otherwise known as Dessert. Our destination Caffe e Gelato Milany, one of Brisbane’s cutting edge vendors of all things gelati. Owned by pole-vaulter Tatiana Grigorieva (the search terms that pop up when you search for Cafe Milany on Google are indicative of some SEO shenanigans)1 They’ve won awards for their iced delights. And it shows. But their coffee left a little to be desired. I ordered my standard double shot flat white – which came with the foam of a poorly made cappuccino. It was a little bitter. But not the worst coffee I’ve ever had. And it was, on the whole, pretty drinkable. I’d say it was a two sugar coffee. Or perhaps a one sugar coffee (provided you’ve ordered some gelati to offset it – the gelati really was amazing). Which I’ve decided might be an appropriate metric for assessing coffees when we’re not at the specialty end of the equation. The temperature was adequate. It was slightly better with the crema stirred through properly. Which is, incidentally, why latte art makes for better coffee. Of all the specialty coffee outlets in Brisbane, Wooloowin’s CoffeeGuy is probably the place that has most frequently enjoyed my patronage. It has the benefit of being a comfortable environment for holding staff meetings, and serving good coffee. It is one of the few places in town where I, after a year of living in Brisbane, can walk in and be served up my usual. In this case, because I visit in the afternoons, my usual is a cappuccino (or two). The CoffeeGuy is a boutique roastery with an incredible vibe. Midway through last year they expanded into the shop next door and created one of those great “third place” environments with comfy couches, polished floors and a display wall of all the incredible coffee gadgetry (though admittedly mostly low-fi stuff that doesn’t require electricity) you could possibly wish to poke a stick at (or purchase). The Coffee machine and counter are pushed against the wall in the corners, facing the floor – so it’s a pretty open space and it feels like you’re hanging out in somebody’s spacious kitchen/dining room. The staff take coffee seriously. Which is nice. And I reckon sitting within sight of big sacks of green beans is a refreshing experience after years where the coffee market was dominated by mega-chains. So. The coffee. Generally the CoffeeGuy offers a tasty, well balanced coffee which is on the earthy/chocolatey side of the spectrum rather than the acidic/bright side. It’s not knock your socks off sensational and full of mouthfeel like other places, nor are their thousands of flavours clamouring for your attention. But it is smooth, sweet, and tasty. And made with the right mix of love and care. I happily trot through the doors almost weekly. And have no problem recommending their wares. There’s not much in the way of food – but their cookies and friands always look worthy of consumption.